NAILED ONE for cheap on EvilBay!! Been tracking APP-1 preamps for years on the net hoping that one day I will find one at a decent price. Astounding since they always go for waaaayyy over $400. Actually more like $500+ for some elusive reason. Do they use titanium/platinum caps and solid gold connectors? be able to cross the US border, get the thing and try it out in person. comparison point as I purchased and used a lot of OD/dist pedals over the last few years. Re: NAILED ONE for cheap on EvilBay!! Well if there is one person that can give a good review it's you Chucky !!!! Go Chucky, good score . I think they use "unobtainium" I'd give one a go (with an MP1 Ch in the loop) at a decent price, but they are even more expensive here . this fine little piece of gear that stayed at the postal depot for 3 months! If only I had known!! I would have ran to it within the first week. This thing is quite impressive I must say. and get ballsy tones right away. You could never guess that it is not running on tubes too. I was able to easily get 80's type hair metal tones in no time. This thing has quite a good amount of gain on tap while remaining practically noiseless. This is one of my recent and most favorite things now. WOW!! I'll get to that, but Jesus if anyone of you guys are wondering about getting one, do so! Especially if you see one below $400. Go Chucky , good score. I'm a bit confused because there are units out there that are similar but not the same. This one for instance is a tube preamp. What are all the differences? Hey Herbyguitar, The APP-1 is solid state, 2 channel preamp with a Fx loop in a stomp box. ADA put allot of work into making it sound good (eg Bloom control to make it sound like tubes etc) and from what Chucky says, it works very well (but only 2 channels/patches, not 128 patches like MP1/2). The MP1Channel is also a stomp box but it just does 1 patch. It was designed to be similar to "one" MP1 patch and uses 2 tubes and similar circuitry to a MP1 to emulate the MP1 sound. I haven't tried either but an APP1 with a MP1channel in its loop will give you 3 options and I suspect sound pretty good. However, they are expensive (and they are stomp boxes). The APP1 can be used with a power amp or into a guitar amp (set eq flat). The MP1Channel is designed more to be into a guitar amp (like a seriously good OD pedal using tubes) or maybe in a Fx loop. It will also drive a poweramp fine but you only have one sound/patch. 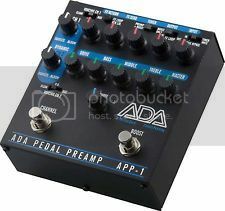 I wish ADA would come up with an updated MP1 rack preamp. I think it would be a winner. "MP1 V 2018"
For sure it would Be a winner I would actually buy it new now that im 40 years old lol! Well we asked ADA for a MP3 but got the MP1ch, they don't seem to want to do rack gear anymore, or maybe they don't think it would sell , the world is awash with stomp boxes these days.